Ettore Boiardi (October 22, 1897 – June 21, 1985) was an Italian-born chef who became famous for his eponymous brand of food products, named Chef Boyardee. Ettore (Hector) Boiardi was born in Piacenza, Italy, to Giuseppe and Maria Maffi Boiardi. On May 9, 1914, at the age of 16, he arrived at Ellis Island aboard the French ship La Lorraine. Boiardi became the head chef at the Plaza Hotel in New York. In 1915, he supervised the catering for the reception of President Woodrow Wilson's second wedding at the Greenbrier, in West Virginia. His entrepreneurial skill became fine-tuned when he opened his first restaurant, Il Giardino d'Italia, at East 9th Street and Woodland Avenue in Cleveland, Ohio, in 1926. Patrons asked for samples and recipes of his spaghetti sauce, which he often gave to customers in old milk bottles. As demand grew, in 1928 he began to use a factory to keep up with orders. It was at this time that he set his sights on selling his product nationally, touting the low cost of his spaghetti products as a good choice to serve to the entire family. In 1929, the product was introduced to the public. In 1938, the factory was moved to Milton, Pennsylvania, where Boiardi had greater input into the quality control of the ingredients placed into his products. He even grew mushrooms in the factory basement for use in his creations. Boiardi was quite proud of his Italian heritage. 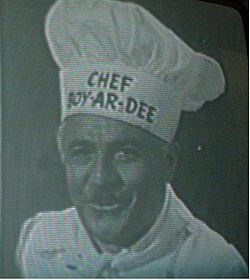 He sold his products under the brand name Chef Boy-Ar-Dee, allowing his American customers to pronounce his name properly (boy-AR-dee). Later, he sold his brand to American Home Foods (later International Home Foods) for approximately $6 million due to family concerns about the company's internal growth and its struggling cashflow after growing so rapidly. Boiardi then took his money and invested a substantial portion into steel mills, which then helped produce goods needed for the Korean war effort. Boiardi's company made and prepared millions of rations for the American and other allied troops during World War II, and for his efforts he was awarded a gold star order of excellence from the United States War Department. He then helped make new Italian food products for the American market until his death. ConAgra Foods acquired International Home Foods in 2000, and continues to use his likeness on Chef Boyardee brand products. Boiardi appeared in many print advertisements and television commercials for his brand in the 1940s, 1950s and 1960s. His last television commercial promoting the brand aired in 1979. Boiardi died in Parma, Ohio, on June 21, 1985 at the age of 87 and was buried in All Souls Cemetery in Chardon, Ohio. At the time of his death, Chef Boy-ar-dee products were bringing in USD $500 million per year. Boiardi's wife Helen died in 1995. At the time of her death, they were survived by their only child, Mario, two grandchildren, and five great-grandchildren. Their only son, Mario Boiardi, died November 24, 2007.